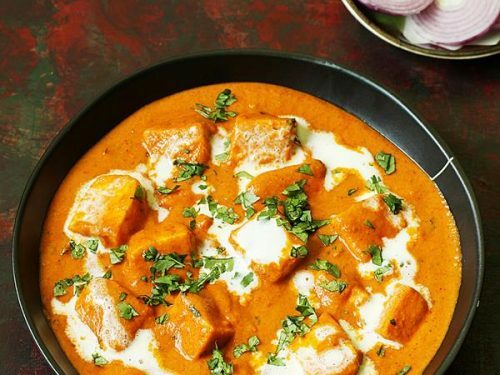 Dum aloo recipe – Easy, delicious, creamy & flavorful restaurant style dum aloo recipe made of spicy onion, tomatoes, cashews & yogurt gravy. Dum aloo is one of the classic Indian dishes served in a special meals like weddings, celebrations or festivals . Dum aloo goes great with ghee rice, plain basmati rice, jeera rice, lachha paratha, plain paratha, puri, naan or roti. 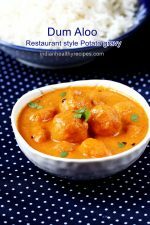 In restaurants to make dum aloo recipe, most times potatoes are deep fried which impart a great unique melt-in-the-mouth texture to the potatoes. 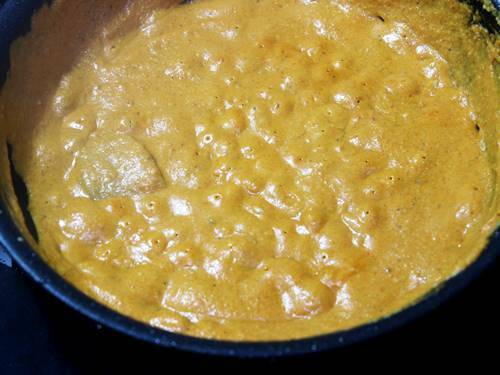 They turn light, tender, delicious and flavorful when added to the spicy gravy. This texture can however not be got by just boiling or steaming them. For a home cooked dum aloo recipe to make the dish healthy, the potatoes can be boiled and used. However I have parboiled them for 3 to 4 mins, then fried them in 3 to 4 tbsp oil for 3 to 4 mins. Then drained the oil and fried until golden. Then they are added to the gravy and dum cooked for a brief time. The dum cooking process makes the aloo very flavorful and delicious. 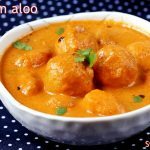 Dum aloo recipe – Slow cooked potatoes in spicy onion tomato and yogurt gravy. This dum aloo is a popular restaurant style North Indian side dish. Serve dum aloo with rice, paratha, naan or roti. Wash and peel potatoes. If using large potatoes, then cube them to equal size. If using baby potatoes make sure all are of the same size. Prick them with a fork to ensure they get cooked from inside as well. Option 1 -Boil the potatoes in 3 cups water until almost cooked or al dente (not mushy). Option 2 Parboil them for 3 to 4 mins. Then cool & shallow fry them in 3 to 4 tbsp of oil until golden. Set them aside. Parboiled and then fried potatoes taste best in the gravy. 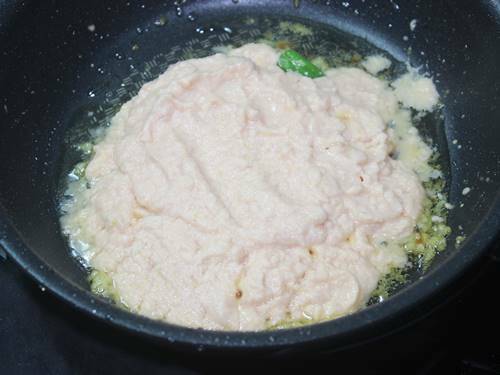 Make a fine paste of cashews, onions and tomatoes. Keep this aside. Heat a pan with oil, and saute bay leaf and cardamom. 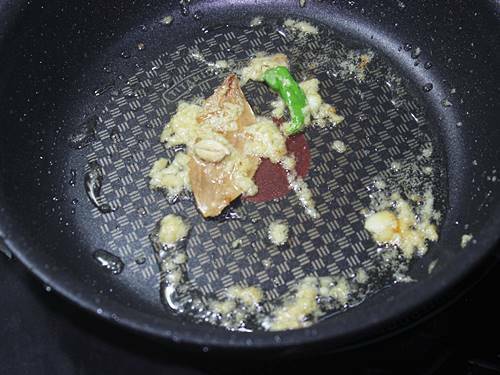 Fry ginger garlic paste until the raw smell goes. Add the onion tomato paste and saute until the raw smell goes away and the paste thickens slightly. Next add chili powder, garam masala, salt and turmeric. Saute until the masala smells good and leave the sides of the pan. 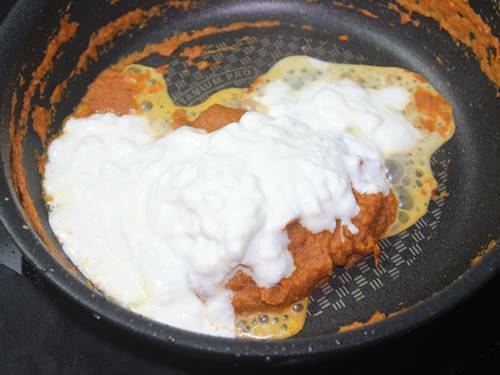 Pour curd and saute until it turns thick. 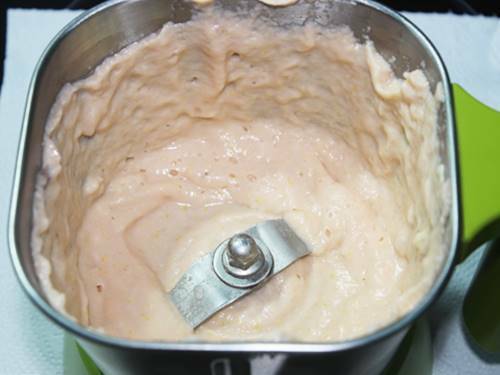 Add potatoes and ½ to ¾ cup water. Stir well and bring the mixture to a boil. Cover with a tight lid or foil. Dum cook on a low heat for 5 to 7 minutes. At this stage the gravy must be thick and potatoes fully cooked. Sprinkle crushed kasuri methi. Stir and cook for just another minute. switch off. 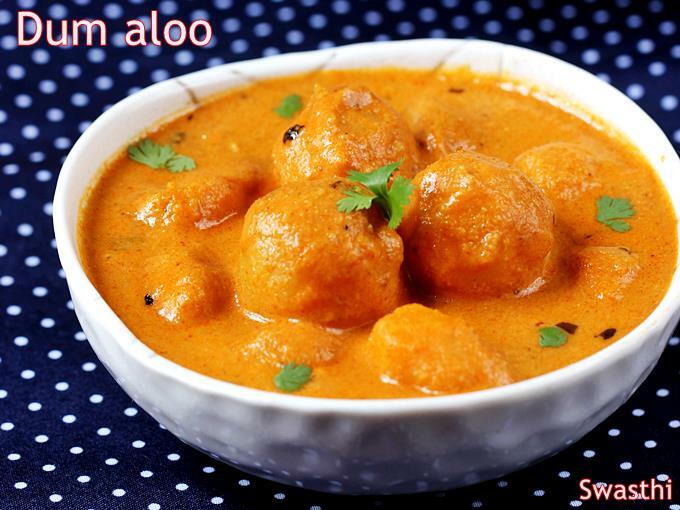 Sprinkle coriander leaves and transfer dum aloo to a serving bowl. Keep covered until dum aloo is served. Dum aloo in restaurants is made by deep frying the potatoes until golden. This makes them light, tender and really delicious when added to the gravy. 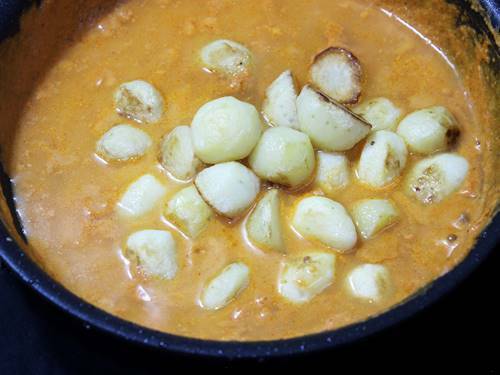 You can either deep fry, shallow fry or just boil and use them in this dum aloo recipe. 1. I have used baby potatoes, but they can be replaced with cubed medium sized potatoes. Wash, peel, cube if large and prick them with fork randomly a few times. 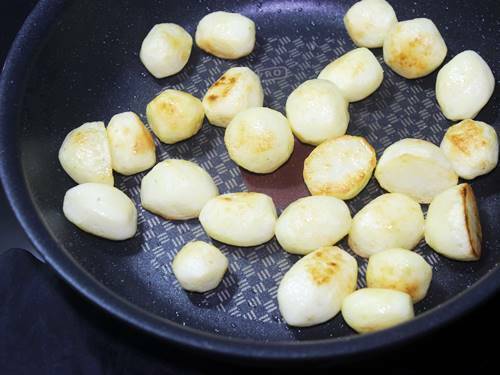 If using uneven sized baby potatoes, cut the large size ones to make all of them of the same size. This way they cook evenly. 2. 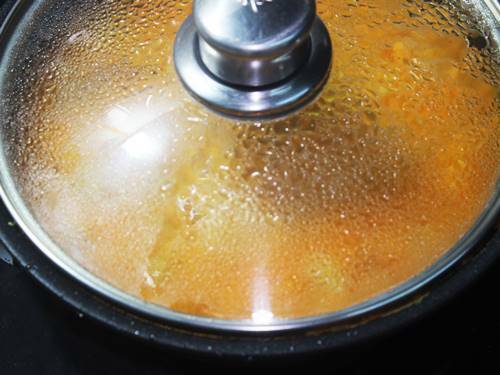 Option 1 – Boil the potatoes in 3 cups of water until almost cooked or al dente (not mushy). Remove from water and keep aside. 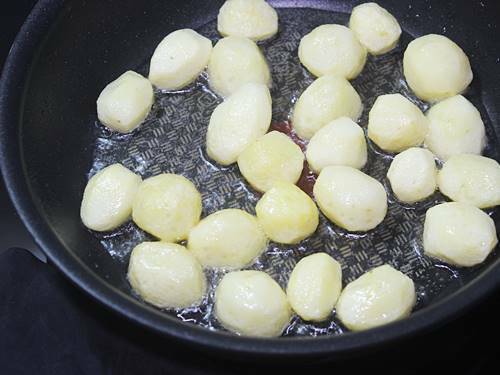 Option 2 – Parboil potatoes for just 3 to 4 mins. Cool & then fry them in 3 to 4 tbsps of oil until golden. You can shallow fry, deep fry or pan fry until golden. I prefer to parboil first and then fry them for 3 mins in oil. 3. I drained off the oil and pan roasted until golden. I do this just to avoid heating oil for a long time. Set these aside. 4. 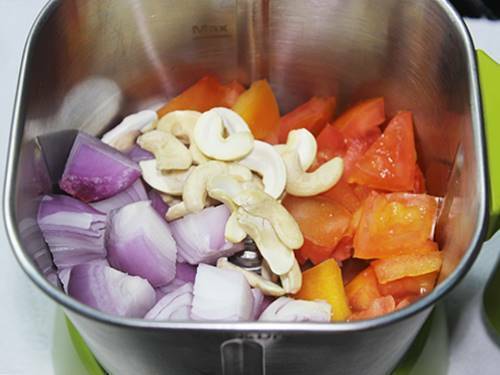 Add cubed onions, deseeded tomatoes and cashews to a blender jar. I am not sure if you can skip cashews. But they lend a richness to the gravy. 5. 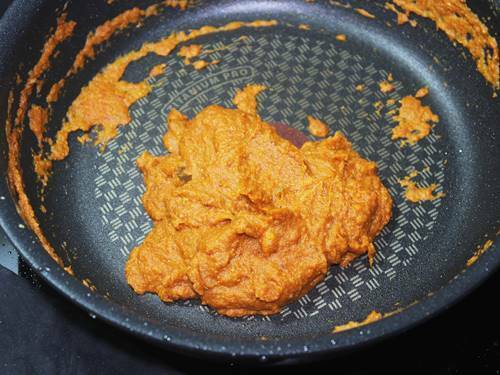 Make a smooth paste. 6. Heat the pan with little oil. Add bay leaf & green cardamom. Saute just for a minute. Add ginger garlic paste and green chili. Saute until the raw smell goes off. 7. 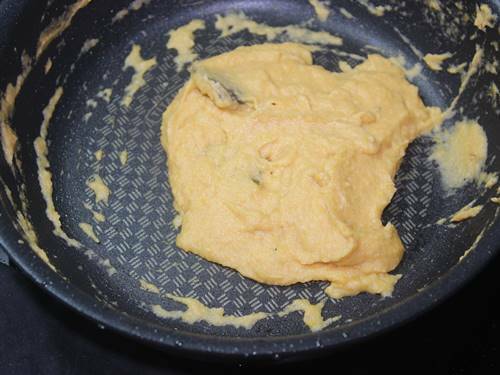 Add the ground paste. 8. Saute until the paste thickens and raw smell goes away. 9. 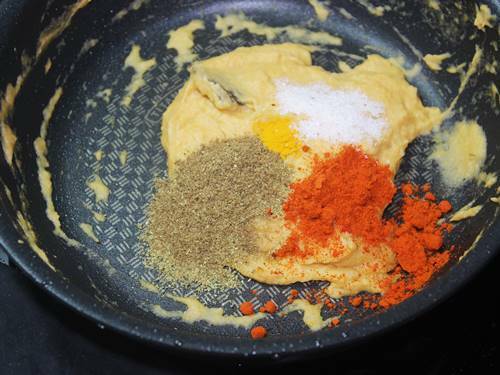 Add salt, turmeric, red chilli powder and garam masala. I used this punjabi garam masala. 10. Saute until the onion tomato masala begins to leave the sides of the pan. Make sure the raw smell has completely gone before you proceed with the next step. 11. Add fresh curd / yogurt. Please note: Do not use sour curd / yogurt. 12. Saute until it thickens and bubbles. 13. Add the fried potatoes and then ½ cup water. If needed add ¼ cup more. 14. Bring the gravy to a boil. Cover with a air tight lid or foil. Then dum cook on a very low flame for 5 to 7 mins. Check whether the potatoes are soft cooked. Make sure the gravy has reached a thick consistency. It thickens a bit more when cooled. 15. Add crushed kasuri methi. Cook for just a minute. Switch off. Transfer to a serving bowl. Keep dum aloo covered until you serve. 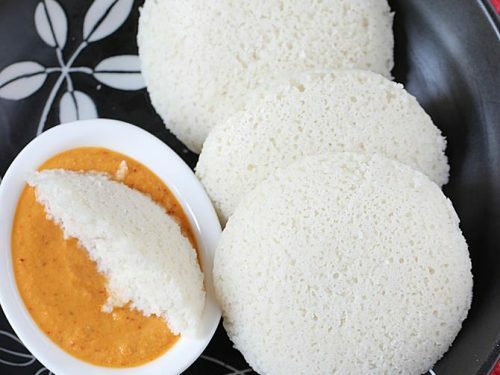 Serve with plain paratha, laccha paratha, naan, roti, plain basmathi rice or jeera rice. Hi, lovely recipe. Will surely try, is there an option to print it out? i cant find one and will be great if i could print this. I couldn’t grind the tomatoes and onions and cashews without adding water to them and then I cooked them. Is that ok? Yes that’s ok. You will need to cook longer for the moisture to evaporate. I really like your recipes but they only make small quantities and I don’t know how to increase them properly as I have just started to learn to cook. How would we increase it for the dum aloo to make a large quantity? Excellent recipe. Came out so well and so easy to make. Thanks for sharing. Yummy. I made this. Turned out very good. 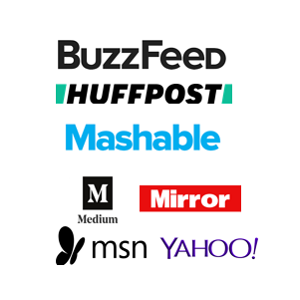 Thanks allot for sharing the information…. 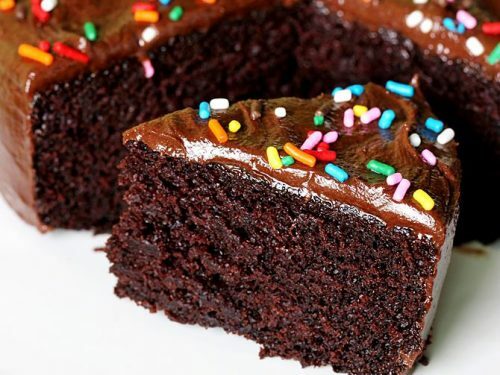 It’s just mouth watering …. It’s amazing one… Thanks allot yaar…. I see in the description section you mentioned to boil the potato for 2-3 minutes however in the picture it looks like you have fried them. 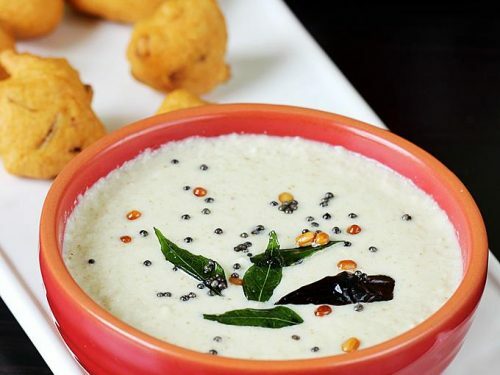 Whats the best way to prepare the aloo? The recipe clearly calls for par boiling for 3 mins. Then drain them and fry them in oil. i have deep fried them just for 3 mins and then drained off the oil. Allowed them to fry in the same pan until golden. Perfect ingredients! Thanks for sharing this mouthwatering recipe! I saw your instructions two days back and decided to make it on the weekend. I just made this today, and it came out very well! Best homemade dum aloo that tasted better than a restaurant. Hi Madam. Greetings from me. U have given a good explanation of preparing dum aloo. But what happens is we r not able to get small potatoes all thru the year in our town. One more thing is that i thought this to be a non-veg item until i read ur recipe details along with photos. 5 stars at any time. Thanks for the comment. 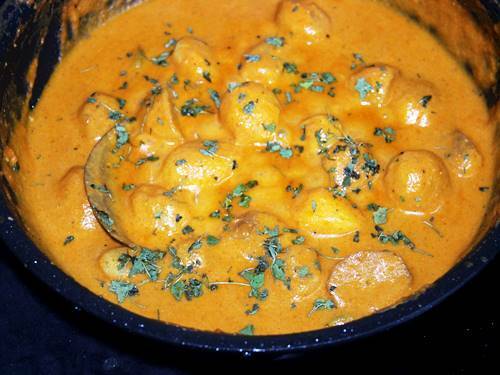 You can make this dum aloo using large potatoes. Just cut them to cubes of 1 to 2 inches and use them in the recipe. It works good. Amazing recipe thanks a lot! 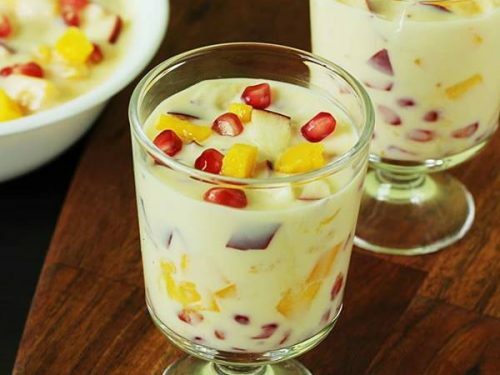 The taste was very sweet… none liked it .. I hv followed each n every step vry carefully still this happend… m vry dissapointed. Thanks dear, being away from home. I miss my wife dishes. Hope I would be able to surprise her once we met . Glad to know you like it. Thanks for trying and sharing the outcome. 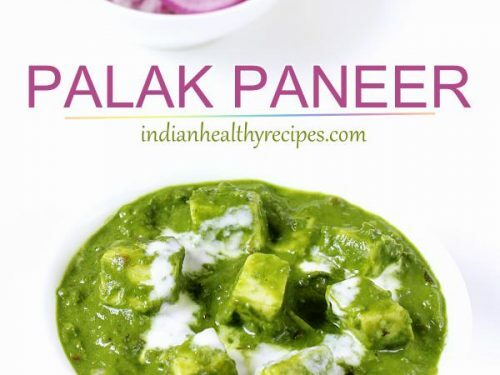 ………..(THANKS RECEIPE SHARE KARNE KE LIYE)……..